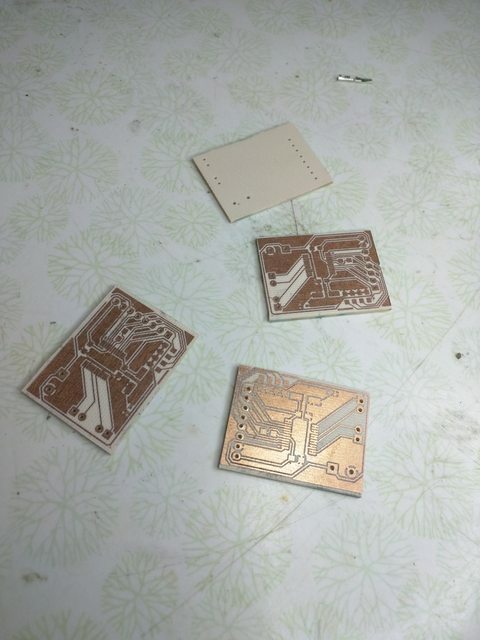 In last week’s post, I discussed a method for DIY PCB etching. This week, I will be continuing in that manner by showing you the final preparation steps I used to get this board ready for soldering including cutting, drilling holes, and protecting the copper with liquid tin. Once the boards were completely etched, the holes for through hole parts had to be drilled. These holes were drilled out on a drill press with carbide CNC bits. This part was a challenge, as I did not have a way to punch marks on the copper. Thus, each hole was centered by sight. It is much easier to transfer and etch multiple boards onto a single piece of copper-clad FR4 than to do each individually. This is exactly what I did. So once the through-holes were drilled, the individual boards were separated from each other. The FR4 was cut on the shop table saw. As I did not leave much room between the individual boards, I took care to keep the kerf of the blade from touching any copper during the cut. Copper is a metal which readily undergoes redox reactions in the atmosphere. The copper of a circuit board is no different. If it is left unprotected, the copper will corrode and damage the functionality of the device. Therefore, we must protect it from the atmosphere. Most PCB fabrication shops apply a mask to the board, covering up all of the leads which do not need to be directly exposed for soldering. The masking materials I have seen are often UV reactive polymers. The etched board is given a thin film of the polymer precursor (often dyed pretty colors, like green), which is then polymerized by exposing the board to intense UV radiation. Unfortunately, we do not currently have any of this material in our shop, so I omitted this step during my fabrication. 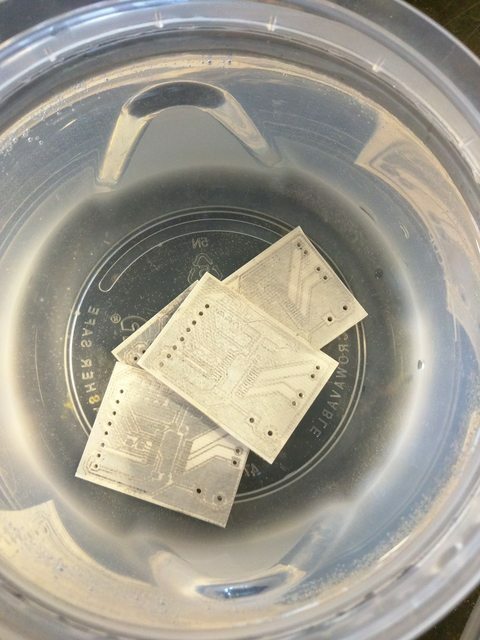 Next, in commercially available boards, the contacts are tinned, while the traces are protected by the polymer. Instead of worrying about the pretty polymer covering, the entirety of the copper on my board was tinned as I did not have the luxury of the polymer coat. Tin plating works well to cover the copper, as the tin protects the copper from water vapor while being very solderable (the solders have roughly a ~50% tin content. 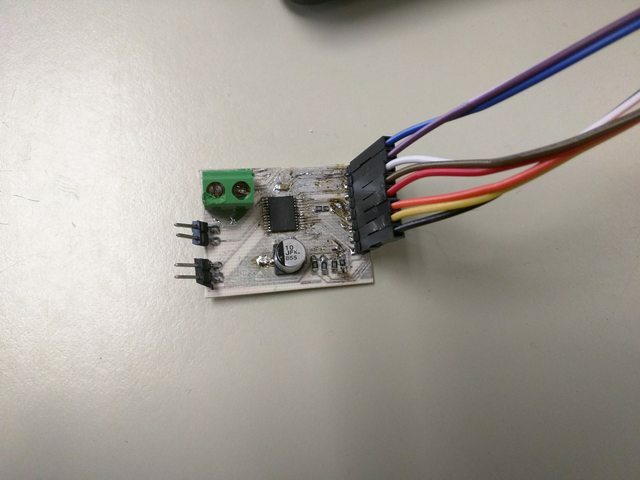 )While this method is fine for prototyping a DIY board, it is not suitable for end-products. This is chiefly because tin has some odd properties that cause issues with time. The name of the process, tinning, is a throwback to the original method used to protect board contacts, application of a tin solution which coats the copper. These days, there are many possible tinning agents to protect your board from the inexpensive bronze amalgam to the costly solid gold plating. Back in the good old days (ca. 1650 C.E.) when you wanted tin plate, the tinsmith would dip the entire metal part in molten tin. With the advent of electricity, electroplating was (re-)discovered. This is still a preferred method for many applications. But we want the quick and easy shortcut. So we will use liquid tin. Obviously our metal ion source is Sn(BF4)2 as well as being the buffer source. The acid takes care of the reduction. The thiourea acts as the complexing agent in this case as well as a stabilizer2. All that remains is the exaltant. According to Mellor, an exaltant is a field specific term (I’m guessing based on German) for a reaction accelerator3. 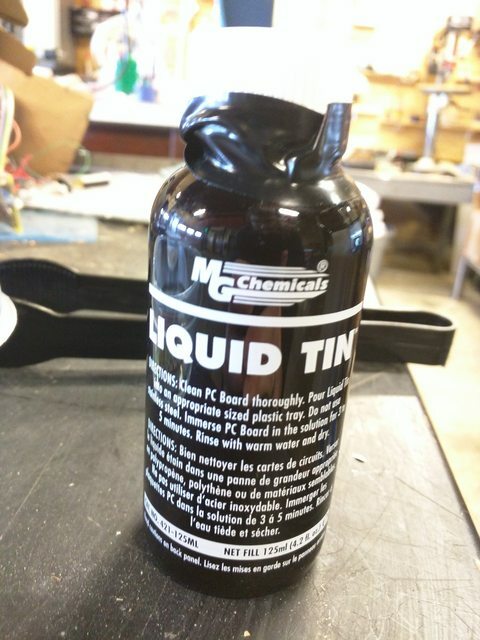 While there are several non-toxic organic acids that the makers of liquid tin might use for this purpose, I wonder if the aqueous fluoroborate satisfies this niche. 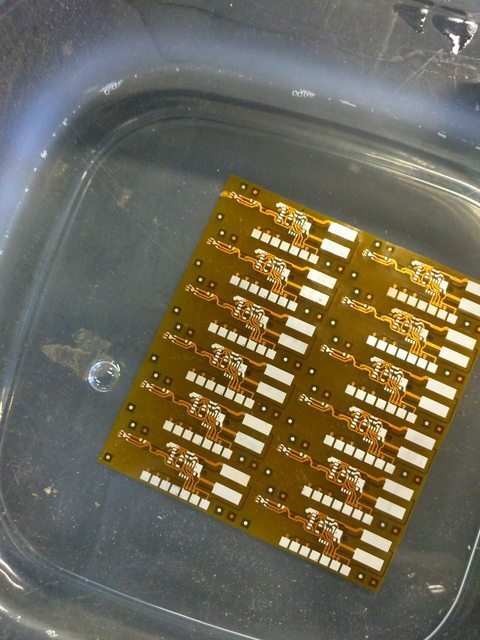 The boards are submerged in the liquid tin solution for a few minutes. As the solution works, rather quickly thanks to our mystery exaltant, you can enjoy the pretty color change from copper to silver. Since the exchange in a liquid tin immersion is surface limited, theoretically you could leave the board in the solution while you work on other things. I was too excited though, so I popped them out right away. The boards I made had a white substrate from the copper clad material, so the tin plating doesn’t show up very well in my picture. That’s why I included the picture below of another circuit I tinned that day on flexible Kapton film. The orange really makes that tin pop. With the board tinned, it is time to solder on the components. Since I’m a crazy person, I solder the SMD parts on by hand instead of using the oven. The result looks a bit ugly, but it is what’s inside that counts. My completed TB6612FNG board is finally complete. B.D. Barker, Electroless deposition of metals, Surface Technology, Volume 12, Issue 1, 1981, Pages 77-88, ISSN 0376-4583, https://doi.org/10.1016/0376-4583(81)90138-2. 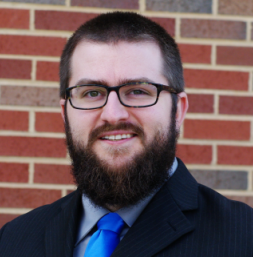 Cassidy, J. E. and Moser, W. and Donaldson, J. D. and Jelen, A. and Nicholson, D. G., Thiourea complexes of tin(II) compounds, Journal of the Chemical Society A: Inorganic, Physical, Theoretical, 1970, Issue 0, pages 173-175, http://dx.doi.org/10.1039/J19700000173. Mellor, B.G., Surface Coatings for Protection Against Wear, 2006, Woodhead Publishing Series in Metals and Surface Engineering, ISBN 9781845691561.